↑ Introductory Mountaineering Course video (view on YouTube). Learn the skills to safely venture beyond tramping tracks and above the snow line! 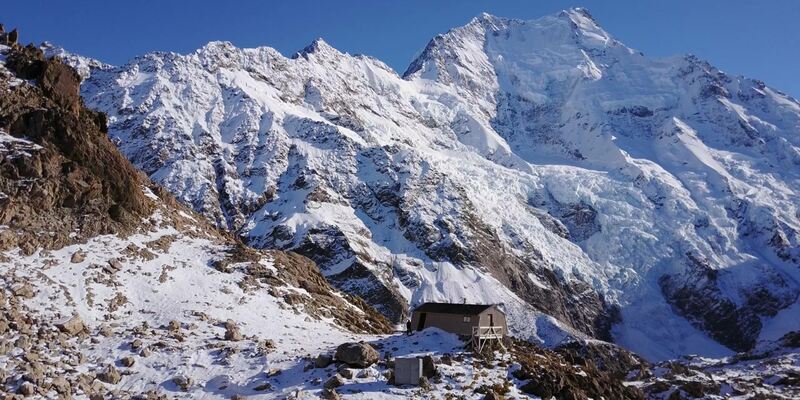 This introduction to alpine terrain is based at our privately owned Caroline Hut located straight opposite the mighty Caroline Face of Aoraki Mount Cook. This course will teach you not only the technical skills of mountaineering and snow craft, but more importantly, improve your risk awareness, and ability to keep safe in the mountains. "For an introduction to climbing in the mountains, there wouldn't be a better facility in NZ." - P. Chapman, Dunedin. More client comments. 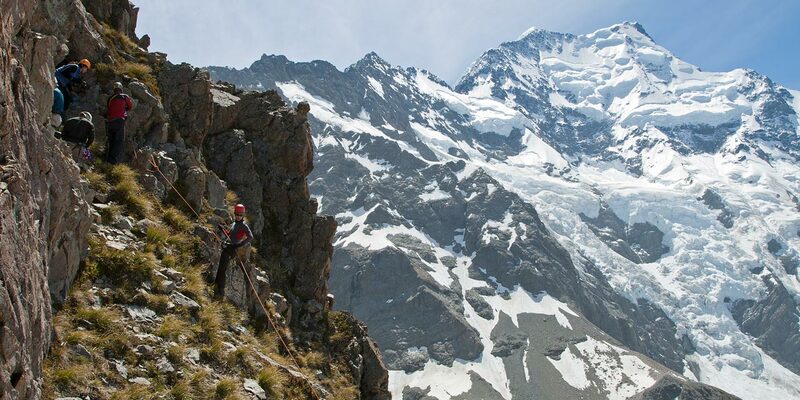 "An Intro to Mountaineering in New Zealand" - a blog review of this course by @bearfoottheory. The Introductory Mountaineering Course covers the basics of snow craft and safe mountain travel techniques. Learn how to use crampons and ice-axe, place snow and ice anchors, assess mountain weather and hazards, and much, much more. Courses are scheduled throughout our summer season (November - April) and include a climb of Kaitiaki Peak, with an emphasis on firm snow and ice skills on the Ball Glacier. Winter courses (July - October) are offered on demand. In winter the emphasis is on soft snow skills, snow shelter building, navigation and avalanche awareness. 2 participants only - the course will be shortened to 4 days. 1 participant only - the course will be shortened to 4 days and an additional fee of NZ will apply. Alternatively you will have the option to reschedule to another trip/date or a full refund. Our private Introductory Mountaineering Courses are ideal for groups wanting to learn the basics of safe travel in alpine terrain. All levels of experience can be catered for with private groups. We will run Introductory Mountaineering Courses during winter on request - please contact us to arrange dates. This course aims to teach the basic skills of mountaineering and places emphasis on developing your abilities to anticipate potential hazards, to identify areas of risk and how to minimise them - essential first skills of mountaineering. The Introductory Mountaineering Course is intended to teach the basics of snow craft and mountain travel techniques and will be tailored according to the needs of participants and the weather, snow and ice conditions at the time. Want to take it further? We recommend our 7 day Intensive Mountaineering Skills Course and 7 day Specialized Alpine Climbing Course, to prepare for technical ascents. If you're not sure where to start, please contact us. Summer courses (November - April) are scheduled for 5 days, but on request we will also run a 4-day course. The course includes a climb of Kaitiaki Peak, 2222m/7290ft, and will teach you snow and ice skills on the Ball Glacier. Winter courses (July - October) are offered on demand. In winter emphasis is on snow skills, snow shelter building, navigation and avalanche awareness. Caroline Hut makes a good classroom as it is warm and cosy and well equipped with instruction material - there is still much that can be covered on a hut day and your guide will keep you busy. The optional topics listed above can be covered on a bad weather day either near or in the hut. If the weather is fine the whole time, then you'll be out in the field, and there may not be time to cover all the optional topics. 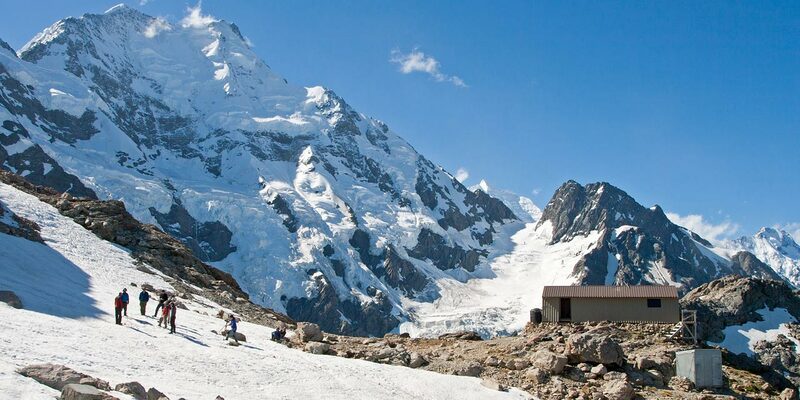 A high level of fitness and extensive hiking, tramping or trekking experience is required. You do not need prior mountaineering experience. Rock climbing experience is an advantage, but is not essential. You do not need prior mountaineering experience. The IDM spans 5 full days, starting 8am on the first day and finishing 5-6pm on the last day. This allows plenty of time for covering all the technical skills you'll expect from this level course as well as exploring new terrain and taking in the spectacular views. As the hut is fully stocked we only need to carry some fresh items of food (e.g. bread, fruit, vegetables, meat) and our personal clothing and equipment. No need to carry sleeping bags. 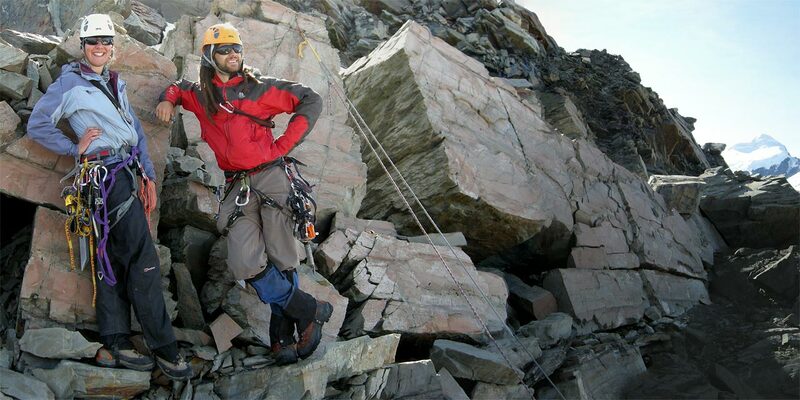 Practise various kinds of belays and anchors, and how to select a good route. 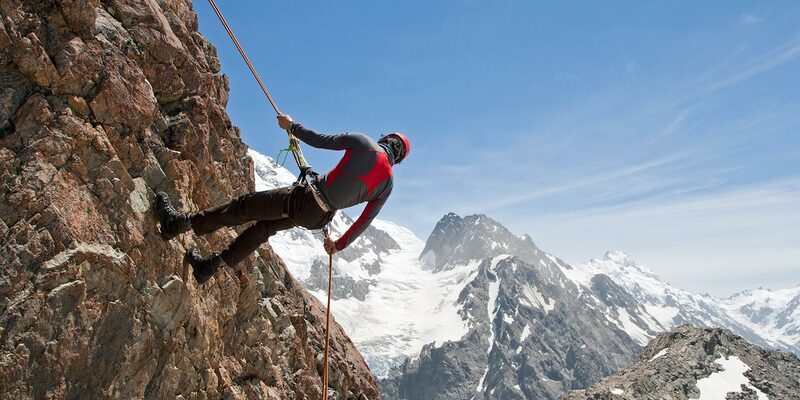 Good cramponing techniques are emphasized, likewise knowing different methods of self-arresting and choosing the right methods for the conditions. Weather assessment will be covered. For climbers who already have considerable rock experience the focus will be on snow and ice skills. There is still time to do a good half-day's instruction, before returning to Mount Cook Village via the Tasman Valley. Return to Lake Tekapo, arriving at 5-6pm. → Introductory Mountaineering Course Clothing & Equipment list. 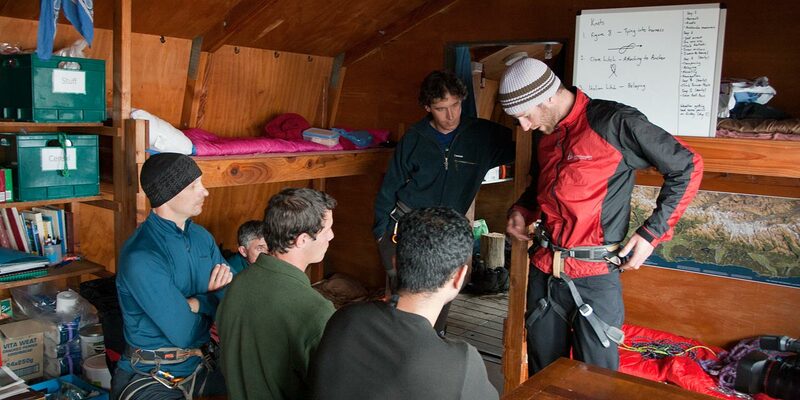 Answers to common questions about the Introductory Mountaineering Course are listed here. Please see our Climbing FAQ's page for anything not specifically related to this course.